Stir together 1/4 cup milk and cornstarch. Whisk together sugar, cocoa, and remaining 1 1/2 cups milk in a small heavy saucepan and bring to a boil over moderate heat, stirring. Whisk in coffee granules. Stir cornstarch mixture again and whisk into coffee mixture. Return to a boil, whisking, then remove from heat. Add vanilla and half of chocolate to saucepan, stirring. Set saucepan in a large bowl of ice water to cool, whisking frequently. Freeze chocolate mixture in ice-cream maker. When nearly frozen, add remaining chocolate and churn until blended. Transfer to an airtight container and store in freezer. 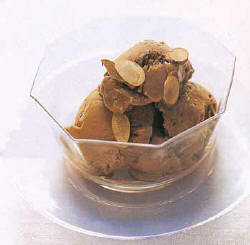 Serve gelato sprinkled with toasted almonds. Source: Gourmet - subscribe to Gourmet Magazine!